Amy’s Kitchen does more than just organic cakes now for dessert options. In fact, as I am typing this from a hotel in Birmingham, Alabama, I have since discovered that Amy’s Organic Kitchen also does ice cream now…dairy free ice cream. No joke. I saw it at the a little natural foods store and the Earth Fare and Whole Foods down here. No joke. Where have I been living? What I did know is that Amy’s Kitchen put out candy bars not too long ago. Yep. Organic candy bars. Trust me, I know…slapping the word organic on the label of something that is chocolate coated, packed with gooey caramel and nuts and…honestly…candy…does not make it healthy or any better than a Snickers. Save that it is made from organic ingredients and not…well…hydrogenated soybean oil (Snickers, I’m looking at you! ), it’s still candy. I understand this. I get this. It doesn’t mean I didn’t pick it up off the shelf at the grocery store when I spotted it and keep it for dessert. Let’s first talk about why Amy’s Kitchen began producing candy in the first place. According to the Web site, Amy’s father, Andy, loves candy. He was the son of a candy maker and spent his childhood sampling chocolate morsels and chewy caramels from his father’s kitchen. To honor Amy’s Organic Kitchen’s commitment to provide great flavor and pure organic ingredients, Andy’s Dandy Candy was created. Andy was the tester for the flavors and when he was satisfied with the outcome…the candy bars were put on the market. Currently, there are four different varieties: Crispy, Crunchy, Chewy, and Creamy. 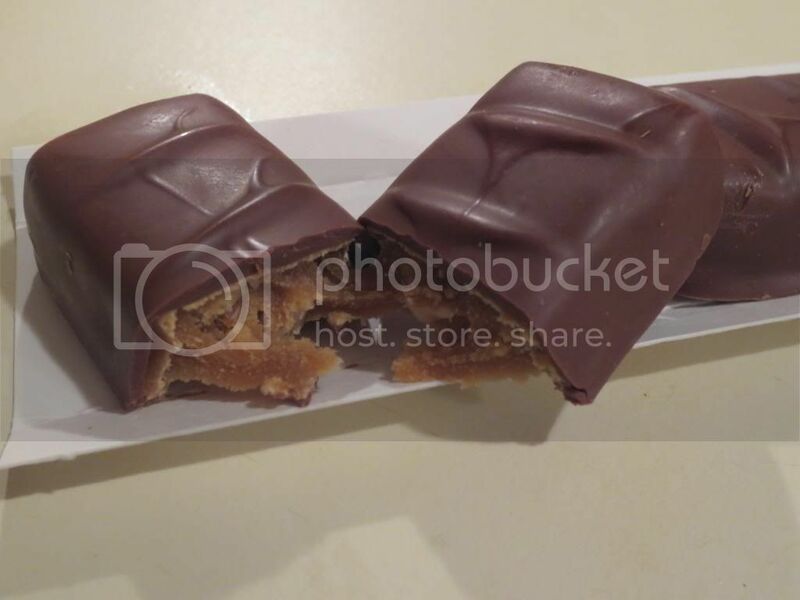 Why Amy’s Organic Kitchen Chewy Candy Bar? Well, it was described, on the package, as soft, chewy caramel with pecans that were coated in chocolate. That sounds like heaven to me. Pecans are one of my favorite nuts. WIN! 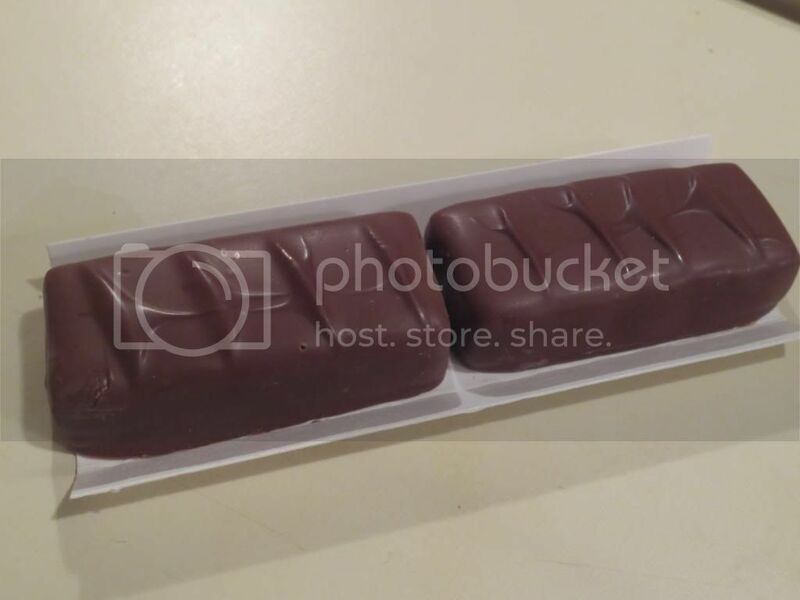 As I was out of dessert options this past week before heading out of town, the roomie and I each had one of the two mini bars that are inside the package of the Amy’s Organic Kitchen Chewy Candy Bar. Yes…one for you and one to either keep for later or share. I highly encourage sharing. Because the more you share, the more these will sell…and they are SO worth it. One bite…and it was like eating a hybrid of a Snickers (with less nuts) and a Rolo. There it is. It was amazing. The caramel was soft and chewy. The chocolate was a nice sweetness. And nothing pairs better with caramel than chocolate. Yum. The pecans were actually quite sizable and prevalent throughout the candy bar itself. It added a nice salty element…so each bite was perfection. I was one happy girl. And this girl doesn’t eat candy, let alone candy bars, all that often. Even Cathy was a fan. So, let’s talk ingredients. Amy’s Organic Kitchen Andy’s Dandy Candy Chewy Candy Bar is made from organic milk chocolate, organic tapioca syrup, organic cane sugar, organic pecans, organic nonfat dry milk, organic grade AA butter, filtered water, organic palm oil, organic vanilla extract, sea salt, organic soy lecithin. It is deliciously organic, made from Rainforest Alliance Certified cocoa, gluten-free, and contains no high fructose corn syrup, preservatives or GMOs. Nothing too off-putting, right? Right. As for the nutrition facts…a serving size is 1 of the 2 mini bars that are included in the pack. One bar will provide you with 100 calories and 6 grams of fat, which is actually good for a candy bar, I think. This little bar has 5 mg of cholesterol, 45 mg sodium, and 9 grams of sugar. 9 grams of sugar for a candy bar is actually not bad at all. A snickers of comparable size has 24 grams of sugar, twice the calories and way more fat and sodium. One serving of the Chewy bar also gives you no filling fiber and only 1 gram of protein. But…it’s candy. Yes…candy. Indulgent treats that I actually do treat myself to every now and again. But, when choosing a candy…choose something a little bit better for you. Less sugar. Less fat. Organic ingredients. No high fructose corn syrup of hydrogenated oils. 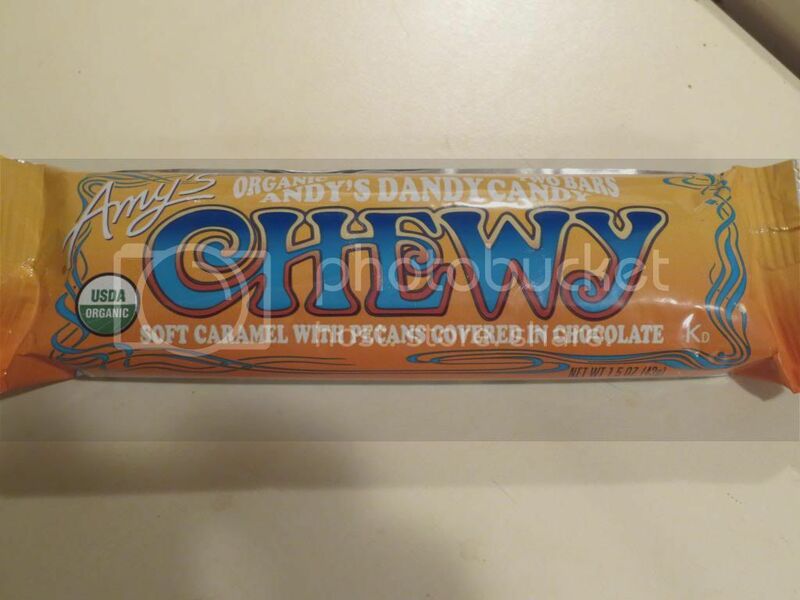 For me…Amy’s Organic Kitchen Andy’s Dandy Candy Chewy Candy Bar is a fantastic option for when the sweet tooth hits. Try it for yourself. And as soon as I can find the other varieties…I’ll give those a try too. This entry was posted in Candy, Chocolate, Dessert, Food, Gluten-Free, Nuts, Products, Review, Snacks, Sweet Stuff, Vegetarian by The Celiathlete. Bookmark the permalink. Only it’s not Gluten free according to their packaging. I nearly gave it to my niece, and she’s just beginning to feel better after discovering her allergies to gluten. I cannot recommend this product because of that. Unsure if this is a recent thing for the company, so please be careful if you still get them. Since I reviewed them 4 years ago it is very possible that things have changed. I am highly sensitive and won’t even buy things that are made on shared equipment. I’ve been seeing a worrying trend of gluten free labels and disclaimers like that on the back in fine print on everything from Oatmeal to gluten free flour. It’s very hard to shop for quality food for my niece when they all seem to be doing the CYA dance. Thanks for the response, be safe, and luck with your runs. You’re amazing. It’s true. And I have seen where previously trusted brands/products now have a shared equipment blurb…it’s frustrating. I agree…it is very hard to shop for anything these days…and it takes forever because I read labels on EVERYTHING. I feel ya! !